When safety is your priority, APM delivers. APM’s affiliate, Global Safety Sources, Inc. (GSSI), guarantees an innovative crew dedicated to ensuring safe job environments for site visitors and workers. One of our GSSI Safety Specialists, Steve Conrad, recently partnered with team members and jobsite personnel to extinguish fall hazards in their work area. They coordinated to put solutions in place early to minimize worker exposure and avoid potential incidents. A scaffold storage area (pictured below) was built next to the unit storm water drain, which was surrounded by uneven gravel and large rocks. The team came up with the solution to build and install a hard barricade system surrounding the area to direct workers around the drain and uneven ground. Additionally, the team noticed issues with the plywood flooring within the scaffold storage area. Many of the corners were warping, causing a trip hazard. 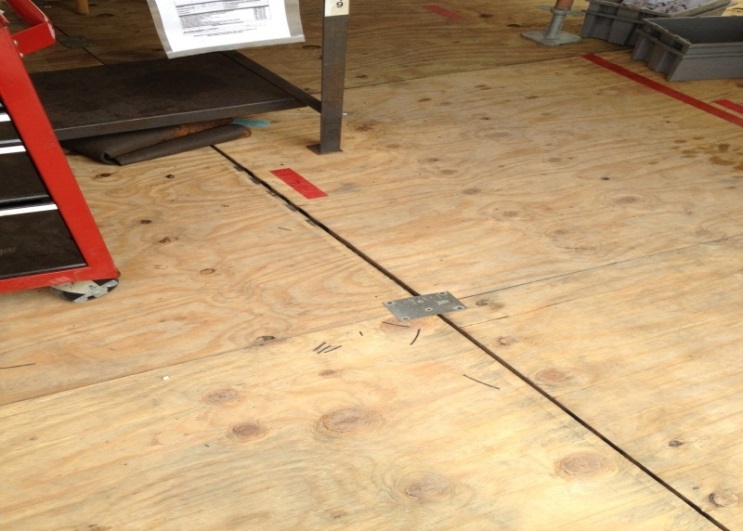 The Inventory Specialist and Millwrights coordinated with the team to put a solution in place, screwing flat metal plates to the four corners of the plywood (pictured below). Congratulations to everyone that put effort into this project. This is the attention to detail and dedication to safety that GSSI is committed to delivering. We’re focused on keeping people safe so that they can stay focused on their job tasks.